Frankie Howerd was one of the great survivors of British comedy. Despite two notable falls in popularity, he always bounced back to the top of the comedy pile. At the time of his death he was probably as popular as he had ever been, even enjoying cult status with younger audiences. With a battery of 'oohs', 'aahs' and 'thrice nays' punctuating his peerless routine of risqué jokes and rambling stories, Howerd by and large successfully negotiated the tricky comedic path of appealing to fresh generations for over forty years. Following pre-war work in concert parties and troop entertainment shows during his war service, the young Howerd first came to prominence through his appearances, between 1946 and 1950, on the radio show Variety Bandbox (1944-52) (he had replaced the 'a' with an 'e' in his surname after joining the touring comedy show For the Fun of It in 1946). His television debut followed in the three-part series The Howerd Crowd (BBC, 1952), written by Eric Sykes , who first worked with Howerd on Variety Bandbox and became a pivotal figure in Howerd 's success throughout the 1950s, writing most of the comedian's material up to 1957. This included Nuts in May (BBC, tx. 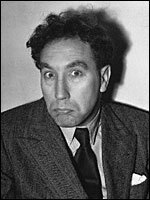 13/5/1953), The Frankie Howerd Show (BBC, tx. 10/9/1953), co-written with Spike Milligan , and Howerd 's first work for ITV , a one-off special, again titled The Howerd Crowd (ITV, tx. 23/2/57). Howerd had also begun to branch out into the worlds of film and theatre, with appearances in The Runaway Bus (d. Val Guest, 1953), Jumping for Joy (d. John Paddy Carstairs, 1955) and The Ladykillers (d. Alexander Mackendrick, 1955) for the cinema, and, for the stage, well-worn farces like Charley's Aunt (1955-56) and The Perfect Woman (1958). In this vein, Howerd appeared in a poorly received television adaptation of Molière 's School for Wives (ITV, tx. 23/4/1958). An extract from the Old Vic 's production of A Midsummer Night's Dream (tx. 31/12/1957) offered BBC viewers a glimpse of Howerd 's Bottom. However, his crown had begun to slip by the late 1950s. Not only were appearances in such theatre productions alienating his old audience, but television producers were beginning to view him as difficult and his humour outdated. A disastrous move into sitcom with Frankly Howerd (BBC, 1959), written by Americans Reuben Ship and Phil Sharp , only served to confirm him as yesterday's man. The next few years were the nadir of his career. Work on stage and, particularly, television became difficult to find, and it was not until 1962 that matters turned again in his favour. On the strength of an appearance at the Evening Standard Theatre Awards in that year, Howerd was booked to appear at Peter Cook 's new centre of satire, The Establishment Club. With a script by Johnny Speight , Ray Galton and Alan Simpson that mixed a few satirical barbs into his usual standard of material, Howerd proved a tremendous success. His appearance at the club led to Ned Sherrin booking him for the popular satire show, That Was The Week That Was (BBC, 1962-63). Galton and Simpson had already written a Comedy Playhouse for the comedian, ' Have You Read This Notice? ' (BBC, tx. 29/3/1963), but it was his appearance on Sherrin 's show that reignited his television career. With a script by Speight mocking Prime Minister Harold Macmillan , his appearance on 6 April 1963 was a triumph. Frankie Howerd was back. A Last Word on the Election (BBC, tx. 18/10/1964) was satire in a similar vein, partly written by Galton and Simpson . The two writers cemented Howerd 's comeback with the series Frankie Howerd (BBC, 1964-66), a splendid mix of typical Howerd chat and comic sketch, in which Frankie found himself in situations not too dissimilar to those once experienced by Galton and Simpson 's previous comic foil, Tony Hancock . All in all, the series showcased Howerd at his best. Howerd 's most successful television work was to be in situation comedy - despite the disastrous reception of the earlier Frankly Howerd series. Between 1963 and 1965, Howerd had starred in the hugely successful London stage production of the Roman-set comedy musical A Funny Thing Happened on the Way to the Forum. Inspired by this success, the television series Up Pompeii (BBC, 1969-70) saw Howerd once again in a toga, this time as the slave Lurcio, serving the house of his master, Ludicrus Sextus, in ancient Pompeii. There may not have been any musical numbers here, but the scripts supplied by Carry On writer Talbot Rothwell (aided by Sid Colin in the second series) packed as many double entendres in to a bawdy half-hour episode as possible. The following years witnessed a succession of similarly styled sitcoms, casting Howerd as a slave or underling in a variety of settings, with diminishing success. These included the direct retreads Further Up Pompeii (BBC, tx. 31/3/1975) and, with imagination at a premium, Further Up Pompeii (ITV, tx. 14/12/1991); Whoops Baghdad (BBC, 1973); and A Touch of the Casanovas (ITV, tx. 31/12/1975). Then Churchill Said to Me (BBC) was particularly dire, with Howerd , for the most part, as a private assigned to an underground HQ in WWII London (he also appeared as a general). Produced in 1982, the series was not to not screened until March 1993 on cable channel UK Gold and April 2000 on terrestrial BBC television. The rise of 'alternative' comedy in Britain in the late 1970s/early 1980s made Howerd 's humour once again seem outmoded, and he experienced a second, though less severe, lull in his career. Good sense prevailed, however, when he was discovered anew by young, particularly student, audiences ('Titter Ye Not' t-shirts were de rigueur), as exemplified by the one-off special Frankie Howerd on Campus (ITV, tx. 24/11/1990), with Howerd performing to a receptive audience of students at the Oxford Union . During his career he had made a number of such 'concert' programmes. East of Howerd (BBC, tx. 1/1/1966) and Frankie Howerd in Ulster (BBC, tx. 14/3/1975) showed him entertaining British troops in Borneo and Northern Ireland respectively (he had been entertaining British forces in far-flung locations since the Korean War). His final television work, Frankie's On... (ITV, 1992), was a series of such concerts (one was on HMS Ark Royal). Six episodes were planned, but only four were completed before he died from a heart attack. He was awarded an OBE in 1977.